While one union continues to wait for results of their experiment, Windsor’s largest union has admitted offering benefits for cannabis products is on their radar too. 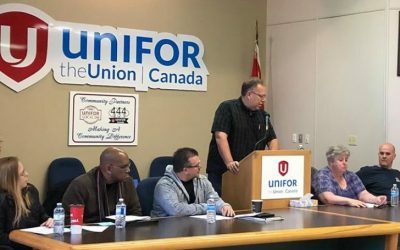 President of Unifor Local 444, Dave Cassidy told BlackburnNews.com some of his members have also raised the issue of offering coverage for things like CBD oil. Cassidy said the union included it in its list of proposals during collective bargaining with its employers which include Fiat Chrysler Automobiles, but he said the company was reticent because medical marijuana is still relatively new. It wanted to see more data before including it in employees’ benefits. “I mean, the only reason, to me, is that there A: is not enough data relative to it, and B: would be the expense,” he explained. LiUNA 625 has been offering benefits for medical cannabis since May 2017 in the hopes some of its members will make the switch from opioids for pain to cannabis products. It is still waiting for the final results of its study, but as of last May, 100 members had replaced their pharmaceutical drugs for medicinal marijuana. LiUNA 625 represents labourers across Windsor-Essex and Chatham-Kent, and Local President, Rob Petroni said many members were prescribed opioids by their doctors after suffering injuries on the job. The union started raising questions about the use of some prescription drugs after the opioid epidemic began to raise its head. Cassidy admits his members work very labour-intensive jobs too, but for the time being, the union is placing a greater focus on avoiding injuries before they occur. “We need to fix the jobs — we do that every single day in the facilities,” he said.